The 2015 Q60 IPL Convertible is designed for one pure purpose – take the dramatic Infiniti Q60 Convertible to an even higher level of premium style and performance. Wearing the IPL badge, which stands for Infiniti Performance Line®, the Q60 IPL Convertible features special aerodynamic styling pieces, the dynamic performance of an IPL-tuned V6, exhaust and suspension, 19-inch IPL aluminum-alloy wheels, and unique leather-appointed interior. 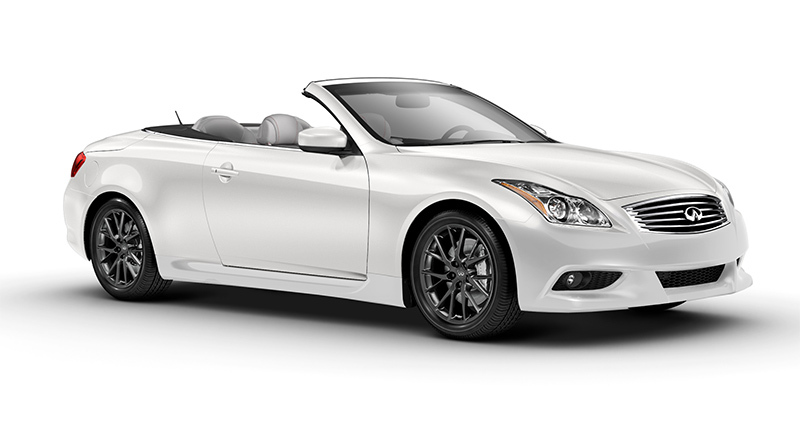 And it is all topped off with the Q60 Convertible’s three-piece retractable hardtop. Based on the premium foundation of the Infiniti Q60 Convertible, the Q60 IPL Convertible features an advanced VQ37VHR 3.7-liter V6. The engine management system has been recalibrated through air-fuel mixture and ignition timing optimization, raising the maximum horsepower output point to 7,400 rpm. To obtain a natural acceleration feel, the torque curve from low revs to the maximum torque point (5,200 rpm) was tuned for linearity. The IPL-tuned high-flow exhaust is a full dual exhaust design with independent left and right large diameter pipes. The muffler’s inner structure and materials have been maximized to reduce pressure and provide an appropriate performance exhaust note. The result is a 30% reduction in exhaust pressure versus a base Q60 Convertible’s Y-pipe exhaust system design. As a result of both the exhaust system and engine management changes, the Q60 IPL Convertible generates 343 horsepower – an increase of 18 horsepower over the non-IPL models – and 273 lb-ft of torque (+6 lb-ft). The engine is matched to an electronically controlled 7-speed automatic transmission with Downshift Rev Matching and quick-shift Drive Sport (DS) mode with magnesium paddle shifters and Adaptive Shift Control (ASC). The Q60 IPL Convertible’s enhanced dynamic vehicle performance focuses on providing confident handling, flat ride and smooth ride comfort. The IPL suspension tuning and damping management philosophy is designed to optimize each aspect of the suspension, effectively connecting the driver to the road surface while minimizing uncomfortable vibrations. Front spring rates have been increase 14 percent over the Q60 Convertible Sport model and rear spring rates increased 4 percent. Front stabilizer spring rates have been increased 6 percent over the Q60 Convertible Sport model and rear stabilizer spring rates increased 125 percent. Shock tuning has also been adjusted and incorporates rear HF-type shocks. 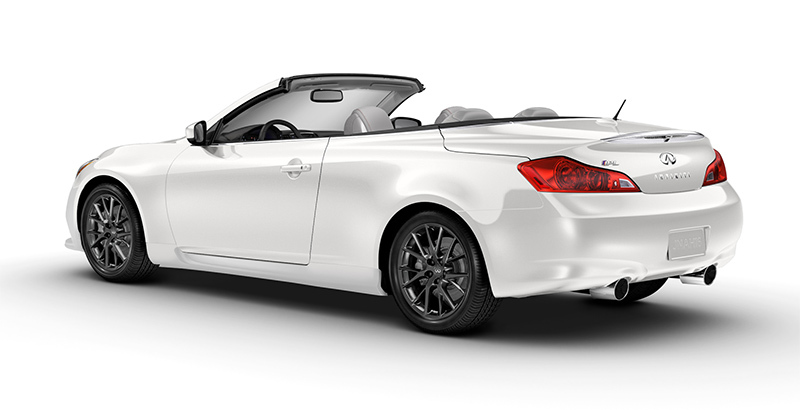 The Q60 IPL Convertible also offers a sport-tuned steering gear and large 4-wheel sport brakes (14-inch front, 13.8-inch rear) with aluminum-alloy opposed calipers (4-piston front/2-piston rear). The Q60 IPL Convertible’s unique exterior includes a dramatic front bumper/fascia design with fog lights and black finishers, sculpted side sills and round chrome exhaust tips. Each part is shaped to complement the Q60 Convertible’s elegantly seductive styling. Combined with the exclusive 19-inch IPL split 7-spoke graphite-finish wheels and low-profile Bridgestone Potenza RE050A performance tires, the Q60 IPL Convertible embraces a road-ready attitude. The Q60 IPL Convertible is offered in just two exterior colors: Majestic White and Malbec Black. The Q60 IPL Convertible interior harmonizes with the exterior styling, offering two color treatments – Stone and IPL-exclusive Monaco Red. 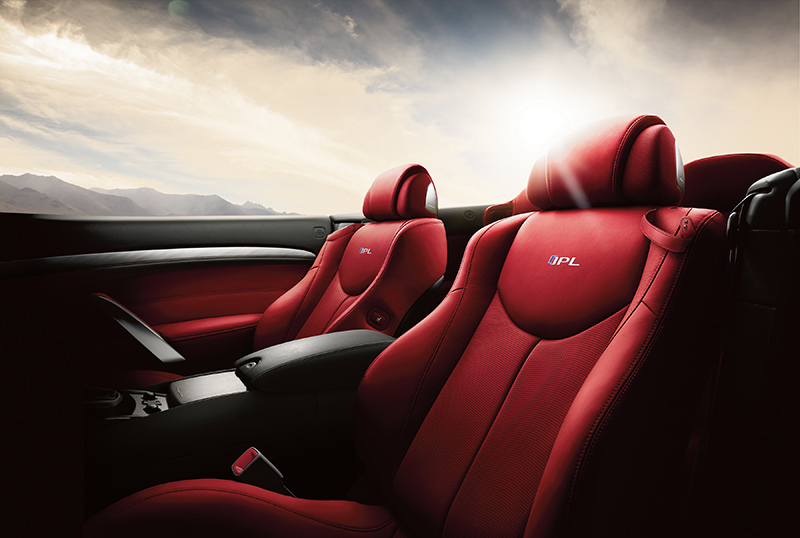 The Q60 IPL Convertible interior also includes red-stitched leather-appointed Climate-controlled front sport seats with embroidered IPL logos, red-stitched steering wheel, Silk Obi aluminum trim, IPL embroidered front floor mats, and aluminum trimmed pedals and footrest. Other standard Q60 IPL Convertible interior features includes a 13-speaker Bose® Open Air Sound System, optimized for both top positions, with AudioPilot® 2.0 noise compensation technology and Personal front seat headrest speakers, an Adaptive Dual Zone Climate Control that automatically adjusts fan speed and air volume based on top position, Bluetooth® Hands-free Phone System, and Infiniti Navigation System with voice recognition, touch screen display, NavTraffic Real-Time Traffic Information, NavWeather with Real-Time Weather and 3-day forecast (SiriusXM® subscription required, sold separately) and Streaming Audio via Bluetooth®. Technological and convenience features include standard Infiniti Intelligent Key with Push Button Ignition, Remote Keyless Entry system, a power tilt/telescoping steering column with increased travel, illuminated glove compartment and automatic temperature control. Also standard is SiriusXM Satellite Radio (SiriusXM subscription required, sold separately) and Rear Sonar System. An Advanced Air Bag System (AABS) with dual-stage supplemental front air bags with seat belt sensors and occupant classification sensor is standard, along with door-mounted curtain side-impact supplemental air bags, front-seat mounted side-impact supplemental air bags and front seat Active Head Restraints. The rear seat includes fixed head rests with rear Pop-up Roll Bars. The Q60 IPL Convertible also features reinforced front side members, front pillars and body sills. The 2015 Q60 IPL Convertible is offered in one fully equipped model, the Q60 IPL Convertible with 7-speed automatic transmission. There are no options.